I have been preaching about the proper use of social media, especially Twitter, lately. And I thought this infographic was a different point of view and way to get across some ideas of social media best practices you should all be aware of. Last week I did a guest post on Dear Blogger on this topic. It was about using social media correctly. But there were a lot of points I did not go over, many of which are covered in this great infographic below. Basically, it covers a whole range of the current social media best practices. I will let you read it first, then summarize what i think are the most worthwhile points at the end. Everyone has a different opinion, and there are no real rules when it comes to social media best practices. I know many of you social media bunnies out there will be well aware of all these things, but it is worth highlighting them all again. Social media seems like an easy thing when you start out, but there are so many hidden rules, it makes it hard for the newcomer to make a go of it. I know I wish I had found such great infographics with all the social media best practices listed for me! It has quickly become quite a popular blog on the web, covering Social Media, Blogging, WordPress, SEO and all that is related to these topics. My aim: to pass on my knowledge – and what I learn, have learned and am sometimes still learning along the way – to you, my dear reader! Again, I guess you could say I am lucky. If I had not broken my leg, I would not be here today, loving the blogging and social media life, connecting with great people such asLorraine, who offers editing tips for bloggers, and writing to you on Greg’s blog. Where did the name Mad Lemmings came from? Greg recently asked me where the name Mad Lemmings came from. After all, most blogs have quite serious names, somehow related to their content. While I was starting my blog, I was kinda sick of seeing all these sites and their boring names (no offense to the other bloggers) so I thought something catchy would be best. Create a brand, and stand out is good advice! In a flash of inspiration, Mad Lemmings just came to me! Maybe because I had played that video game with the crazy lemmings falling off the cliff as a kid? Who knows. So that is my blogging story, about how I came to be a blogger. I’ve got many interests and and have worked as a web developer for years. I didn’t find the time to blog until my accident. I also didn’t have the time to become so heavily involved in social media until then. Which brings me to the reason why I am here today. Today I thought I would take this awesome opportunity to teach you all a little social media savvy, from what I have learned over the recent months. Sorry about that heading. I am a little into magic. But what this actually means is: in the beginning of your social media life, pick a platform, any platform. And stick with it for a while. Don’t spread yourself too thin, or you won’t succeed at anything. This is never truer when it comes to social media. There are so many platforms, and I know you want to be on them all. You can be, but just take your time with each each one. Focus on one at a time. Build your following. Then expand to the next. It will pay off in the end. You will get decent traffic from your chosen platform, rather than just a trickle or less from all of them when you first start. One of the biggest mistakes you can make when using social media is not using the right format, words, links or language. Speaking the “local language” can actually make a huge difference, and it is something you should be aware of for the social media platform you are focusing on. For example, on Twitter you only have 140 characters to get your message across. So there are a lot of things you need to consider in order to construct the perfect tweet. Google Plus is another very fickle platform. Most people just write a quick sentence, add a link and think you’re done. There is actually a better way of doing this, and the Google Plus gurus can tell you how to really create the perfect Google Plus post. Likewise, Facebook, LinkedIn and Pinterest also have very specific techniques and methods you can use to optimize your posts, so make sure you know what they are. Just take a quick look on Google search. You will find a lot of information on how to perfect your posts on whatever social media platform it is you are focusing on. One of the fundamental tenets of social media is sharing. You will hear many a blogger and social media guru talk about it. But what do they really mean? Well, I will continue with Twitter as my example, as that is my main social media home. If you were skimming about, make sure to read this next part! On Twitter you have the opportunity to share a boatload of content throughout the day. Each tweet only has a limited life (minutes? seconds, sometimes!) so you can certainly tweet a lot. But what your followers on Twitter are expecting is that you tweet more than stuff about yourself and your products or posts. Sure, they want to get to know you. So tweeting a little about yourself is okay. However, when you are tweeting for your blog or business, it should be mostly professional. You should share other peoples’ stuff. This is super-important!!! More specifically, share posts from the people in your niche. Trust me on this one. You will get noticed more if you share a lot of other relevant and interesting information. Just sprinkle your self-promotion in among them. People expect you to. They just don’t like having your products shoved at them all the time. By mixing it up, you’ll get noticed faster. There are a lot of ways that you can increase your reach and amplify your voice on social media. One of the first ways is getting to know influential people in your niche. Don’t go for the most influential people at first, because getting noticed takes time. But if you aim for mid-level people, you will get attention far more easily. Sharing their content is important, as is interaction. Comment on their tweets. Always give thanks for retweets. And sometimes just a little bit of chit-chat goes a long way. Another way to extend your reach on social media is to make use of the many sharing platforms out there. I know what you are thinking, what kinds of platforms? Well there are a lot, but some examples off the top of my head include: Triberr, JustRetweet, ViralContentBuzz, andEmpire Avenue. If you want some more detailed information on how to use these sites, I have done another guest post on this very topic. The beauty of these platforms is that many of the mid- to high-level influencers use them. So you will get social media love from many people, and sometimes, from the big guns too. You will see your stats spike when that happens. It has happened to me before, and the rush is awesome! All of the above tips will get you far. Believe me, I have improved a lot in social media over the last few months, and it is these strategies that have helped. But what you also need to be doing, just a little each day, is increasing your following. If this is something you want to do on Twitter, I can help you out for sure. 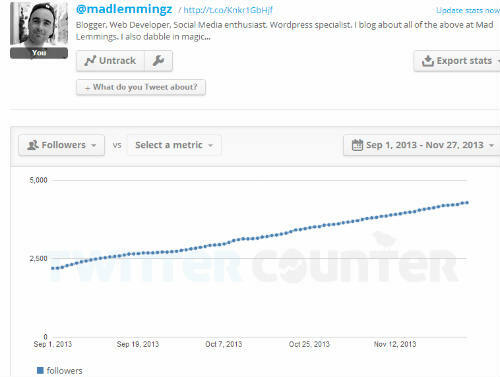 My current stats include nearly 4300 followers and this is what my growth looked like over the last 3 months. In fact I am in the process of publishing an eBook on this very subject. So stay tuned for that! In the meantime, here are a few tips you can use to increase your following. Follow people using hashtags in your niche. Of course this all applies to Twitter, but the ideas are the same across all social media. Quick Interjection from Greg…As I mentioned in Lorraine’s check-list, I always planned to blog solo here. I felt this would make it easier to connect 1-1 with you – and keep those connections going. This worked for about 5 months until I basically fell off a blogging cliff; I didn’t anticipate our scale of growth or readership. In blogging it can be dangerous to think you can control everything or that things will always stay the same – they won’t. It’s adapt or graveyard, and as the blog grew it became clear I needed a team to keep our quality levels high, and to keep me grounded. When I found two other bloggers with the excitement and vision for fluffless blogging answers I outlined in our first post ever, I knew it was time. Blogs I worship – CopyBlogger, ProBlogger, FirePoleMarketing – all started as one person then expanded. I’m not saying my goal is to be them or anything; it’s quite different. But this helps. That said, I introduce you to Lorraine, the excitably writer/editor/teacher who turns simple WordPress pages to gold, and now Ashley, the quiet Swiss webmaster who always has the right plugin or fix for your site. Taking them on here was 5% about my own agenda and 95% about delivering new answers to you. Trust that I’ll write more on this – a formal welcome – soon, but for now I needed to bring you, especially you long-term readers, up to speed. Social media can seem very difficult when you are first starting out, so take it easy, and just focus on one platform at a time. Research what the perfect formats are for your chosen social media platform, and use those. Share other peoples’ stuff and watch the benefits roll in. Last but not least, connect with relevant people in your niche however you can. If you have any questions or ideas you want to share, I would love to hear from you in the comments below! And feel free to drop in to Mad Lemmings and say hi! Reblogged this on Jane Jacquelie Vestil.